Timing is everything. This fact of life is true with just about every decision we make. Many investors believe timing the market is everything. Selling out of equities before the market has a downturn can be a very lucrative strategy, if you get the timing right. And with hindsight it always looks obvious. However, the factors leading to a downturn are often unpredictable. Timing the market, while good on paper, can be challenging in practice. At Firetrail, we believe timing the market is THE HARDEST decision an investor can make. This article looks at the theoretical attraction of timing the market, why it is challenging in practice and finally a look at timing the GFC. In our view, timing the market is a speculative, high risk and low return strategy. To prove this, we conducted analysis on the largest negative returns on the Australian equities market over the past 25 years (more than 7% drawdown). The chart below highlights that there were 16 negative returns over 7%. The average size of the drawdowns was 15%. But the biggest drawdown (the GFC) skewed this quite significantly. Taking out the GFC, the average drawdown was 13%. 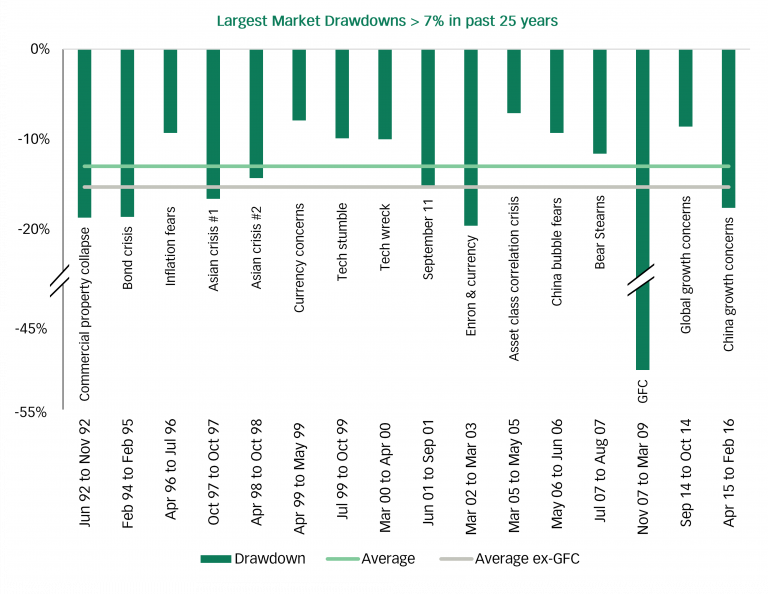 What is clear from the data is that if you could time the market, avoiding the 16 largest equities market drawdowns over the past 25 years would have added significant value to your investments. However, could you have predicted the catalysts and the timing to perfection? The statistical chance of getting every market timing call right to the day is about one billion to one. Not even Warren Buffet is skilled enough to win that bet! The big fall in the GFC skews the results, so we have temporarily taken this out of the next part of our analysis. Our research showed that the worst market downturns are almost always followed (or preceded) by the best market rally’s. Excluding the GFC, if you timed the equity market downturns correctly BUT you were just one month early or one month late in your timing, you would have returned the same result as being fully invested. That’s right! You would have effectively wasted your research time and effort to come up with the same result as being fully invested. This excludes transaction costs of executing these market timing events. So, you have picked the market downturn correctly 15 times in a row, but you had to be correct within one month on every occasion just to breakeven. The chart below highlights the returns of timing (and miss by a month) vs the market returns. An expensive, risky and unrewarding result. Now, let’s look at the elephant in the room. The Global Financial Crisis (GFC). From peak to trough, the market fell over 50%, in a 17-month period ending in March 2009. If you timed the GFC to perfection, you would have saved a significant amount of money. But consider this. Following the fall of over 50%, would you have been brave enough to step back into the equities market in April 2009? The market performance during the GFC was the worst return in over 30 years. However, the BEST return of the market in the past 30 years was between April 2009 to December 2009, where the market rallied +62%. Now clearly when a market falls 50% it needs to rally 100% to get back to square. But the point is, the biggest upswing the market has seen for 30+ years was straight after the worst downturn. Is timing the equity market a lucrative investment strategy? If you time it to perfection, the answer is certainly yes. However, in practice the information and skill required to time the market with the accuracy required to add value consistently is challenging at best. Getting the timing wrong by just one month would leave you with the same result as no action. And that excludes transaction costs. At Firetrail, we believe the best thing we can do for clients is to stay fully invested in the equity market over the long-term and add value through bottom-up stock selection. In our view, it is a more sustainable way to generate returns for our clients than to place speculative bets on cash versus equities. Interests in the Firetrail Absolute Return Fund (ARSN 624 135 879) and Firetrail Australian High Conviction Fund (ARSN 624 136 045) (‘Funds’) are issued by Pinnacle Fund Services Limited ABN 29 082 494 362 AFSL 238371. Pinnacle Fund Services Limited is not licensed to provide financial product advice. A copy of the most recent Product Disclosure Statement (‘PDS’) of the Funds can be located at (VIEW LINK) You should consider the current PDS in its entirety and consult your financial adviser before making an investment decision. For those who know little about the stock market "to stay fully invested in the equity market over the long-term" would be the hope of investment management but for those of us who understand technical analysis its not rational. Quite obviously though, anyone who remained invested during the GFC have, broadly speaking, still not recouped their losses nine long years later. All Ords being just 6,276 from almost 7000 points. Hi David & Robyn, the All Ords Index doesn't include dividends. You'll find if you include dividends (which are a major component of total return, especially for Australian equities) the ASX has long since recovered from its GFC losses.